Common Christmas Scams and How to Avoid Them! You are here: Home / Finance / The Grocery Shop for FREE Podcast–Episode 32: Common Christmas Scams and How to Avoid Them! 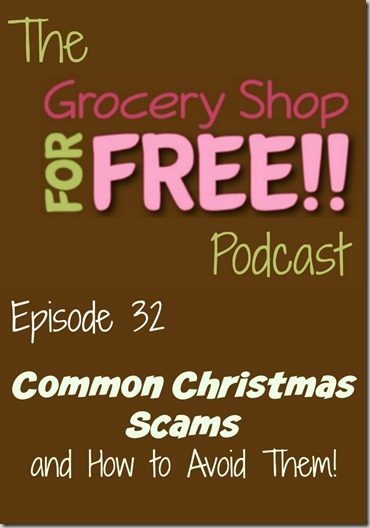 The Grocery Shop for FREE Podcast–Episode 32: Common Christmas Scams and How to Avoid Them! This week’s Grocery Shop for FREE Podcast is up! This week talk with Robert Siciliano about Common Christmas Scams and How to Avoid Them. You can find out more information about Robert and get a copy of his book from his website, or follow him on FaceBook, Twitter or Linkedin. Robert is also raising funds for Boston Children’s Hospital by running the Boston Marathon and you can donate to this worthy cause here. Please subscribe to the Podcast on iTunes or Stitcher and leave us a review. The show notes are below and we have included both the audio and video for you. appear to be from legitimate charitable organizations. appearing to be from Fed Ex, UPS or the U.S. Customs Service. be environmentally conscious. Worms mask as Hallmark e-cards and more. “discounted” luxury gifts from brand names. information, which is then sold to marketers or used for ID thefts. high-paying jobs and work-from-home moneymaking opportunities. because often times these purchases never reach their new owner. malware to record keystrokes, called keylogging. official-looking e-mails from financial institutions.